(2 Customer Reviews) | Write Review 13 issues per year "CrossStitcher is the only cross stitching magazine that combines fresh contemporary ideas with lifestyle inspiration and creative techniques to help you make the most of your hobby. Our pool of talented designers brings you a variety of trend-led projects alongside all the technical advice you’ll need to get started. You’ll find clever ideas for making your designs into gifts, accessories and homestyle items, while our expert-led Savvy Stitcher feature demonstrates a variety of new techniques for you to try. Whether your style is vintage, contemporary or quirky, you'll find something to get you stitching straight away - so grab a hoop, thread your needle and start stitching today! Looking for CrossStitcher in print? Unfortunately pocketmags.com does not sell print copies of CrossStitcher, but all is not lost. Our partner at magazine.co.uk sells print subscriptions at the best prices online. We all like our Christmas traditional and can picture just how the perfect festive scene looks. The CrossStitcher team all named snow as an essential ingredient, yet a white Christmas isn't something many of us experience these days. Fear not, we've let it snow for you this issue. 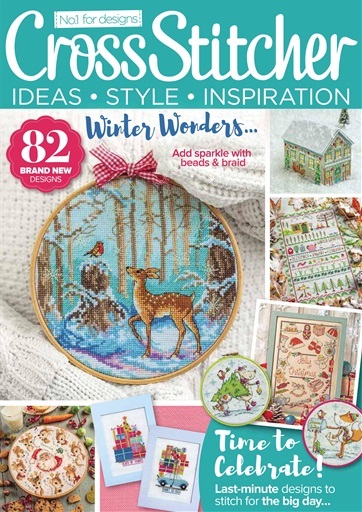 "CrossStitcher is the only cross stitching magazine that combines fresh contemporary ideas with lifestyle inspiration and creative techniques to help you make the most of your hobby. Our pool of talented designers brings you a variety of trend-led projects alongside all the technical advice you’ll need to get started. You’ll find clever ideas for making your designs into gifts, accessories and homestyle items, while our expert-led Savvy Stitcher feature demonstrates a variety of new techniques for you to try. Whether your style is vintage, contemporary or quirky, you'll find something to get you stitching straight away - so grab a hoop, thread your needle and start stitching today! 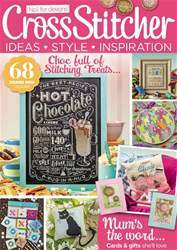 You'll receive 13 issues during a 1 year CrossStitcher magazine subscription. This is, by far, my favourite cross stitch magazine. I definitely think this magazine has appeal for a younger generation of stitchers (I'm including myself even though I'm in my 40s). The designs are modern and fun. While some of them are cute, the designs aren't "cutesy". I usually save multiple patterns from each issue for my "to stitch someday" pile. It never disappoints. 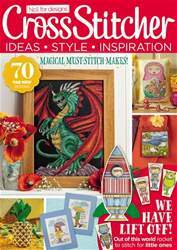 Cross Stitcher is my favourite cross stitch magazine. The patterns are modern, colourful and fun. I feel like this magazine has the most appeal for a younger generation of cross stitchers. There's always a variety of patterns and it's very rare that I don't find myself wanting to stitch at least one (if not more) of the patterns in each edition. 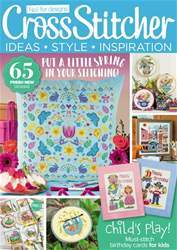 You'll receive 13 issues during a 1 year CrossStitcher magazine print subscription.